These are SO cute… creative, too! I think I’m going to blog about this and share the fun!! Great Idea. Edible ornaments are fun. We made these for the very first time this year when my grandson was out for Christmas break. I was going to photograph them and blog about them as well. But everyone loved them so much that we passe them all out. I figure we’ll make more when Valentine’s Day rolls around. I have a heart-shaped cookie cutter. Next time we’ll know to make extra! You’ll have to let us know when you make up some more, and we can post a pic of your treasures! 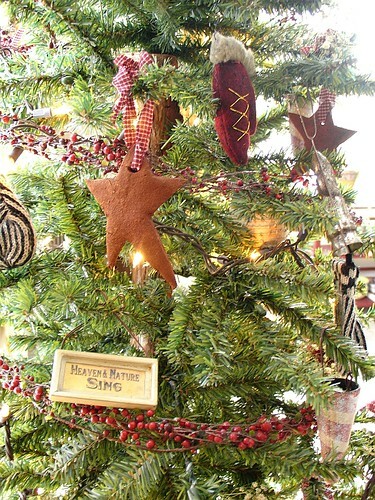 Your star ornaments w/the fabric ribbon look very sweet – kind of what you’d expect to find on a tree a hundred yrs ago. We made some of the cinnamon ornaments and painted them with model car paints. When I walk by the tree I can smell the cinnamon. It made me think I’d like to have only handmade ornaments on our tree – as well as ones that are special…rather than just having something to fill up the tree. If you add Elmer’s white glue to the mix…the ornaments become more “stable”. The first yr – most of ours broke and crumbled…this yr I found you could add glue to the mixture – as well as bake them for a few hours on very low temp (last time they air dried). Edi – Thanks for sharing. I have read recipes about adding glue, but I just decided to make them a bit thicker. It seemed to work, as I am still using ornaments that I made 5 years ago! Thanks so much for taking the time to share! Sounds like your painted ornaments are really nice! You’ll have to post a picture in the Home & Garden Forums! My son wants to make cinnamon ornaments because my daughter is in third grade and just made them last week!! !I only want to make two very small ones and i dont want to use too much cinnamon, but i have plenty of applesauce and glue to use!! !Please if you have a recipe that uses glue with it and not too much cinnamon and other spices please let me know!My three year old son has been bugging me constantly!Thank you!!!! They’re charming! I like the glittery ones too! Thanks for the reminder about the forum! I keep intending on visiting 🙂 I’ll do so now. Thanks for sharing all your wonderful ideas using the cinnamon/applesauce ornaments. Have always wanted to make these, just never have. Perhaps with your suggestions…I’ll try them. Also, love the glittery ones. Happy Holidays! Hello! I just found this site by accident, and I LOVE IT! My sister-in-law has been making these ornaments, and I had intended to try them for myself. After reading about them here, I am trying them for sure! I keep primitive little pine trees in my home year round, and I think these ornaments would look wonderful on them. I am a Mother of four, and am always…did I stress ALWAYS? lol…looking for ways to cut corners. So keep up the good work and add more frugal ideas, please. Hi, I have just found your amazing blog and wanted to say how pleased I am I found you. I have wanted to make cinnamon decorations for a while but thought they were too complex ingredients, yours are simple and look fantastic. Thank you for sharing….. I love these. I’ve wanted to make some for awhile, but I’m in this stage where I’m putting off some crafts until my girls are a little older and can do some crafting with me! I’m getting ready to make this recipe. It sounds wonderful! I tried to look up the glittery stars on the bluejean primitive website, but couldn’t find them on the site. Any ideas what she used to make the stars so thick and smooth? What would you suggest I try? Also, how do you keep the ornaments from curling while drying? Thanks for your help! Love these! We’re making these today after Thanksgiving dinner. I SAW THIS RECIPE SOME YEARS BACK AND MADE THEM WITH MY DAUGHTER.WE HAD FUN MAKING GINGERBREADMEN AND HEARTS.I USE THEM AS BOWL FILLERS AND WE HAVE SOME AS ORNAMENTS.I LOVE THEM! I’M GOING TO TRY THE GLITTERY STARS WHICH I THINK YOU WOULD MAKE THE SAME WAY MAKING SURE THE BATTER IS NOT TO DRY SO YOU DON’T GET THE SMALL CRACKS.IT SHOULD BE FUN. 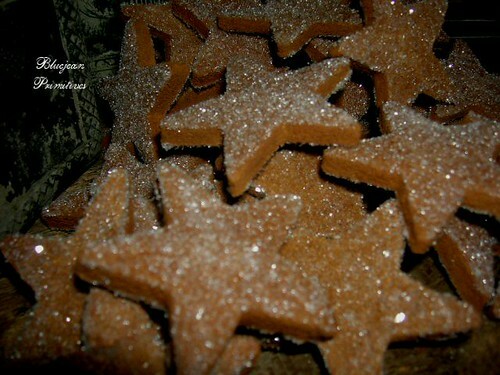 These look so perfect…I can’t wait to make them with my children…instead of using gingerbread! I love these and linked to you from my site on homemade applesauce making. I’m trying to figure out how to do a trackback. Not sure if I did it right! I helped kids make these in a prekindergarten class, once. I always thought they’d make great car air fresheners, too! I made some of these ornaments 15 years ago and am still using them. They were decorated with tiny pinecones and silk flowers, with narrow ribbon hangers. They still have fragrance, but this year I may use an emory board to lightly “sand” the surface to renew the scent. I expect to have them for many more years to come! 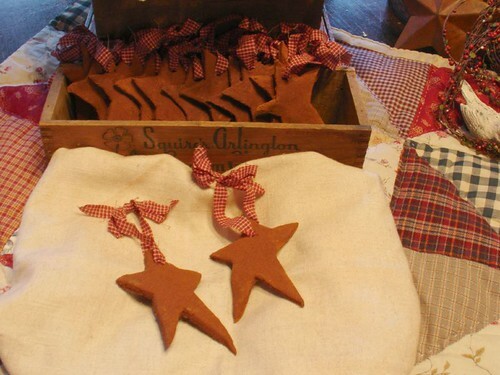 My 4 year old daughter and I are going cookie cutter hunting to make these this year. She is so excited and so am I . Merry Christmas everyone! I am a kindergarten teacher and have 38 students. How much cinnamon and applesauce would I need to purchase? I made these, but I used a gingerbread cookie cutter and used royal icing to decorate like gingerbread men. My cub scout pack makes these every December to give to the patients at our local soldier’s home. They are a great hit. These are wonderful. A classic for sure, but still a great craft to do with little ones. I will be posting this one to my FB page and tweeting it too! Thanks! I have been making these for years for my childrens school classes and at nursing homes for activities for the reisdents. THey love these recipes. I am a collector of cookie cutters so they have way to many to choose from. We enjoy ourselvesvery much. I would like to know how to make the glittery ornaments, though. Can anyone help me with that.Thank you in advance for your help. I love this idea. I’m going to make them for my fourth graders to give to their parents for Christmas. How much cinnamon and applesauce do I use for 22 students? Jessica ~ Although I’ve never made ornaments with a large class before, I would suggest that you use at least 4 cups each. I have been making these for years. They are easy, smell good and fun. So many different shapes to make for so many different holiday’s. Sooo….we made these and they smell amazing..but, they never dried hard enough to pick up?? any thoughts? I would continue to turn them each day & allow them to dry fully. Their drying time could differ depending on your climate & temp. in your home. I love these beautiful little ornaments, I’m linking this on my blog. Great Idea. Going to make them with my first grade daughters and their friend the day we get out for Christmas break….We are going to have an ornament making party!!!! Can’t wait…I made these with my son(who is now 18) when he was in first grade….love it….I still have some of his on the tree….and if I sniff really hard I can still smell them. where can i find the primitive star shape like you did? Planning to make heart shaped ones for my daughter’s wedding and attach an “antique” brass key and a tag with each person’s name and table name on them. They will help them find their seats and be a little favor to go home.